Baroness Sayeeda Warsi made headlines when she became the first Muslim woman to sit in the British Cabinet, but in 2014 she resigned over her disagreement with the government’s policy on Gaza. Now a member of the House of Lords, Baroness Warsi has recently published a book, The Enemy Within: A Tale of Muslim Britain, in which she lays out her perspective on the lessons and challenges of being Muslim in Britain. 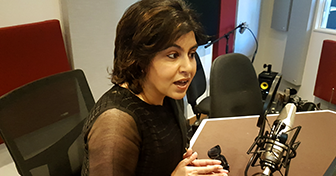 In this Ramadan podcast, she tells Remona Aly about the demands of reconciling faith and fasting in the political arena, and explains how her Islamic faith is an integral part of her own British ideals and values. She discusses some of the issues affecting faith communities in Britain, and why she thinks the state has become paranoid in its dealings with Muslims. This podcast was recorded before the Manchester bombing on 22nd May 2017, in which 22 people were killed.